Several common Nymphalid butterflies, like the Comma, Peacock and Small Tortoiseshell (but also the Brimstone) overwinter as adults. They were born the previous summer and spent the sunny days of late summer and early autumn feeding and accumulating the fat reserves needed to spend the winter. Then they searched for a suitable dry, sheltered place (often inside outbuildings or roof spaces) and entered a resting period during the colder months of the year, when nectar resources are most scarce. These are often the first butterflies to fly on spring, sometimes awaken during sunny, mild winter days, but most regularly appearing in later March and early April. While before their winter rest, food was the only thing on their minds and they were happy to feed in groups, their interests during spring are clearly shifted to reproduction. Now males are actively defending temporal territories around south-facing nettle beds waiting for passing females, and fighting intruding males in spiral flights. When a female is detected, he will chase her at high speed to court her. This afternoon, on a sunny clearing full of sprouting nettles, four Small Tortoiseshells danced around each other. A pair, eventually found themselves on their own and landed on the ground. The male approached the female from behind and started to court her tapping her with his antennae (above). She will normally fly away again and the settling and tapping will continue until she accepts his advances and they mate on a sheltered spot on the ground. 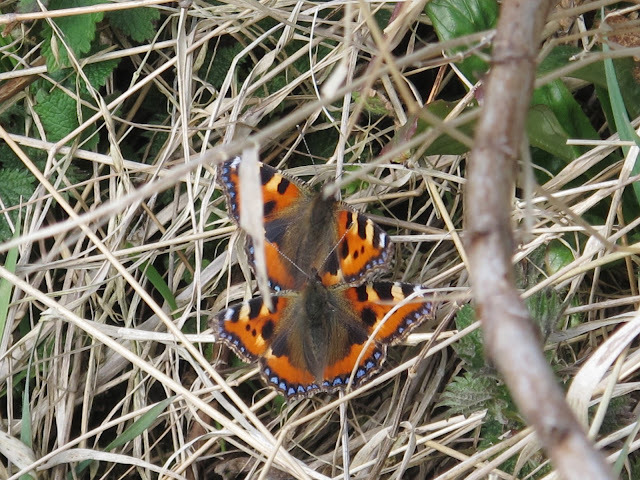 The pair of courting tortoiseshells flew away quickly before I could see where they settled. You can watch a video of the courtship of the Small Tortoiseshell here.